How to Select the Best Commercial & Industrial Chipper Shredder? 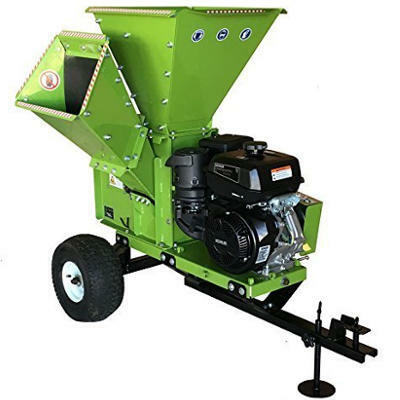 If you’re a business owner or a farmer ready to purchase the best commercial chipper shredder for the money, this buying guide can help. We turn what could normally be a hard task, into something more manageable, all by providing reviews for-top rated industrial wood chippers and tree shredders. When you’re finding it difficult to know how to get the best deal when you buy online, there are ways to solve the problem. Simply make a comparison between the features and the price, and choose a machine which best suits your particular needs. If you’re looking for a commercial or industrial wood chipper shredder, it’s clear to see there’s much chipping, shredding, and mulching to be done. But how do you know which machine is up to the task? After all, with a wide variety for sale both online and in-store, choosing just one can be difficult. That is why it’s important you first ascertain the work being completed before you start the buying process. A large chipping job will require a machine with plenty of horse power, whilst a small, one-off job may require something a little less powerful – and therefore, less expensive. There are over 10 deaths every day within industrial and commercial lines of work in the United States. With this in mind, it’s important to understand that failure to remain safe around machinery could put your life at risk. When you purchase a dangerous piece of machinery such as an industrial wood chipper, tree shredder or mulcher, you should read the manufacturer’s manual and follow all instructions. It’s not enough to rely on the safety mechanisms on the machine, you must also use your common sense and follow the safety recommendations within the manual, and within your own workplace. Not operating the machine without supervision. Not operating the machine if you are not experienced or qualified to do so. Not operating the machine if its maintenance is not up-to-scratch. Wearing a hard hat, safety goggles, ear protection, gloves, and boots. Ensuring all guards are in the correct position and aren’t damaged. Keeping arms and legs away from the in-feed hopper. Not leaving the machine running while unattended. Operating the machine on even ground. It can be all too easy to purchase a wood chipper shredder at the lowest price, thinking you’re getting a good deal. However, if that machine wasn’t suitable for the tasks you are getting it to do, it could quickly become a bad purchase decision. When you’re looking to purchase the best commercial wood chipper shredder for the money, efficiency is everything. Time is money, therefore you must choose one with the right specifications for the job at hand. This could include more horsepower for larger jobs, a larger in-feed chute, and better blades. Most commercial and industrial wood chipper shredders are similar in their features, with the main difference being their level of power. Most have a collared hopper, a collection tub, and a chipper mechanism. The larger machines also can have grooved rollers with a self-feeding function, hydraulic controls, and a blade to provide consistent chip sizes for the production of particleboard. Many commercial and industrial tree shredders and wood chippers are also used in the production of garden chips for landscaping companies. When you’re looking for the right machine for the job, you should ensure you take the horsepower, the chipping capacity, and the reduction ratio into consideration. Many brands and models of wood chippers come with a manufacturer’s guide. Within this guide, operators can learn about the in-depth maintenance process in order to extend the life of the tool. Maintenance is very important on such a dangerous piece of machinery, and it must be done right. You can either undertake this maintenance yourself, or outsource the work to a professional. Clearing away debris from the engine. Making sure all moving parts are lubricated and are clear of debris. Refilling the fuel and oil and refreshing the oil regularly. Replacing, rotating, or changing the blades/knives. For some people, visiting a physical store to buy a commercial or industrial wood chipper shredder is inconvenient. Often, the price for a new machine can also be higher as well. This is why so many business owners are looking to buy online. When you’re wanting to get the best deal, Amazon and other similar websites are popular platforms. You can read other customer reviews, and get an idea of the components in relation to the cost. Once you know the features you require, you can work out a fair price to pay, potentially saving you hundreds of dollars. It has a powerful 429cc engine. The NorAm centrifugal clutch is heavy duty. The wheels are oversized to assist in portability. It can chip branches at 3.5 inches in diameter faster than many other wood chippers on the market. It’s quite affordable, given its extensive list of features. Even at 400 pounds, shipping is free. It comes on an easy-to-tow trailer. The 60-pound rotor helps with power in the wood chipping process. It’s more suitable for a small farm or lifestyle block with small-to-medium chipping requirements. It doesn’t arrive fully assembled. For its size, you would expect it to chip branches larger in diameter. 3-year engine warranty, 2-year chipper warranty. Dimensions: 48 x 31.5 x 56.5 inches. Chipping Capacity: 3 ½ inches. Warranty: 3-year engine warranty, 2-year chipper warranty. AKohler Command Pro CH440 14HP. QWhat kind of feed system does it have? AIt comes with a towing trailer kit. This has 15 x 6.5 inch turf wheels mounted in bearings with a retractable trailer stand. It’s hard to know where to place this Yardbeast wood chipper shredder on the market. It’s not capable of fast-paced, large chipping jobs within a large commercial or industrial business, yet it can be too big for a residential section. Its price tag would be off-putting for homeowners who could find it convenient, and it might still be out of reach for lifestyle block owners, too. The best place this machine is suitable for, is on a farm. It’s easy to tow, it has an engine with a lot of grunt, and it can make short work of most branches with twigs at 3 ½ inches in diameter. It just doesn’t seem to fit into any niche nicely. That’s not to say this machine isn’t exceptionally powerful and well-built, it’s just not strong enough to be desired by most professionals, and is unaffordable for most homeowners. Therefore, it’s not one of the best commercial wood chipper shredders for the money. Check out what other people who purchased this product think about it. Read Yardbeast 2090 commercial and industrial wood chipper shredder reviews. Its 420cc engine allows it to chip with relative ease. It shuts down when it’s low on oil to protect the engine. It has pneumatic tires which are easy to tow over variable terrain. It has a dual feed unit with a drop-in shredding hopper and chipper chute. It’s heavy in comparison to some other brands. It’s not that easy to tow. Dimensions: 36.5 x 28.5 x 56 inches. AWith 10 hammers and 10 shredding blades. QHow big are the tires? QDoes it have an electric start button? If you require reliability around your lifestyle block, workplace or farm, this Powerhorse unit is for you. It has a powerful 420cc engine, can be wheeled across variable terrain on its pneumatic tires, and even comes with a 2-year warranty. While it’s heavy in comparison to other models, it’s durable, solid, and is built out of well-made parts. You can even benefit from its dual feed unit for both mulching and chipping. This is certainly a top-rated product that is sure to become one of your favorite machines to operate. Check out what other people who purchased this product think about it. 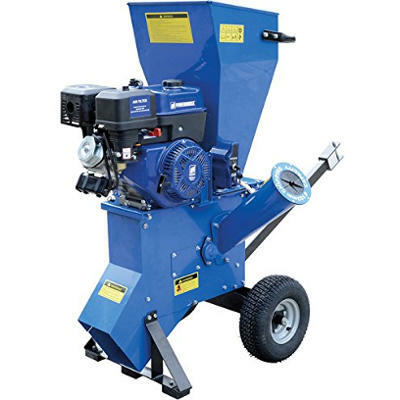 Read Powerhorse commercial and industrial wood chipper shredder reviews. It’s large and powerful, perfect for a commercial or residential operation. The cutting blades cut very efficiently. It self-feeds through a 2-way system. It can make chips or mulch. It’s exceptionally durable as it’s made from heavy steel. It comes with a tow bar, an extra belt, a chip bag, and a blade. 12 bags of waste can be turned into one bag of chips or mulch. It can be cheaper to purchase at Home Depot than it is on Amazon. The blades go dull very quickly. It only comes with a 1-year warranty. Brush Master wood chipper shredder. Dimensions: 44.5 x 34.5 x 29.5 inches. Chipping Capacity: 4 inches in diameter. ABranches at 4 inches in diameter or smaller, only. QCan you use wet materials? AYes, but doing so clogs the hopper. For a low-end chipper, this Brush Master represents good buying. It comes with plenty of accessories, a low price tag, and enthusiasm for hard work. It can chip wood of up to 4 inches in diameter, and even has a separate infeed area for mulch. You can chip or mulch to your heart’s content – turning 20 bags of garden waste into one bag of chips. It’s economical, easy to maintain and is also very portable. It’s clearly one of the best commercial wood chipper shredders for the money. Check out what other people who purchased this product think about it. 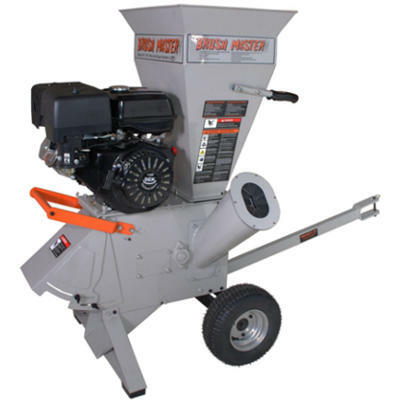 Read Brush Master CH4M17 commercial and industrial wood chipper shredder reviews. It can chip wood at 3 x 4 inches into ¼ inch chips. It has a 2-way feed system for leaves and wood. The funnel for twigs and leaves is oversized for convenience. It has a better warranty than several other brands on the market. Dimensions: 34 x 44.5 x 29.5 inches. Chipping Capacity: 3 x 4 inches. ALandscapers, large lot owners, rental, and yard clean up. QWhat is the engine make and model? A15HP DEK OHV engine model CH1. Although it’s not an industrial wood chipper, this DEK wood chipper shredder still packs a punch in terms of power. It takes all the hard work out of most small commercial jobs, and is easy to use for both mulching and chipping. It’s covered by a generous 2-year warranty, and its 15HP DEK OHB engine provides unrivalled power to chip branches at 3 x 4 inches. Although its price tag is quite high in comparison to other brands on the market, you pay for quality. It’s easy to label this DEK machine as one of the best to buy online. Check out what other people who purchased this product think about it. 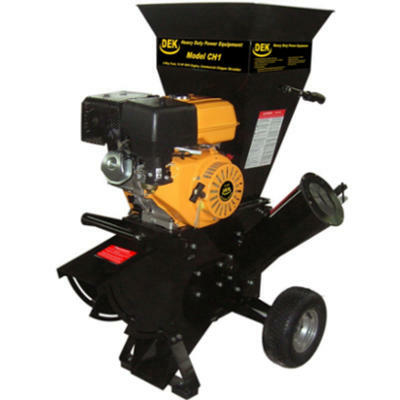 Read DEK commercial and industrial wood chipper shredder reviews. It has a powerful 6.5HP, EPA approved engine. It can chip 3-5 cubic meters per hour. It can handle branches of up to 4 inches in diameter. It has reversible, hardened steel cutting blades. It’s lighter than several other models on the market. The instructions are poor for assembly. It’s only suitable for lifestyle block owners. Dimensions: 34.25 x 33.5 x 22 inches. ALifestyle block owners and farmers. QWhat is its productivity rate? A3-5 cubic meters in one hour. If you’re looking for a small-to-medium wood chipper to clear farm and lifestyle block lots of branches, this Samson wood chipper is the machine for the job. What it lacks in power, it makes up for in speed and durability. It can be towed with ease, and even comes with additional blades for your convenience. It’s not going to be suitable for a large commercial operation, but it does tick all the boxes for smaller tasks. It’s affordable, well-built and will be a much-loved asset on any farm. Check out what other people who purchased this product think about it. Read Samson commercial and industrial wood chipper shredder reviews. Where to Buy Industrial & Commercial Wood Chipper Shredders? Don’t be afraid to step outside your comfort zone when it comes to making big ticket purchases online. While the internet can be terrifying for some people, it’s a very legitimate avenue for making large purchases of equipment and machinery. In fact, you often get the best deal when you buy online, on websites such as Amazon. Whether you’re looking for a mulcher, a shredder, a chipper, or one that does all three, you are sure to find exactly what you’re looking for when you buy online.